Monday I got a pedicure. I chose dark purple polish. I made sure I had something purple to wear today. Last year on my birthday I wrote a post for all the loved ones I have lost. I can find no other words in my heart to express the feelings that swirl within. So for Heather and Mike, today, one year after Maddie passed away, I'll share what I wrote last May. Maddie - There are few leaders who could unite people as you did and continue to do. You opened my eyes to a community I knew existed but didn't share in until now. Your beautiful blond curls and shining eyes will forever remind me of the goodness of people. I hope your family knows how powerful your grace is. Each year I remember them all on their days and I cherish the lessons, the friendships, the laughter, and the love. I am a better me because of them. 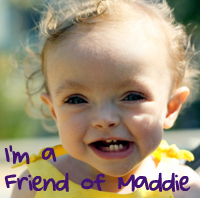 I am walking in the March for Babies on April 24th as part of Team Maddie. Will you help me raise money today, on Maddie's day, so that others do not experience grief like the Spohrs and so many other families?